MV Wild Ride by Picchiotti. Wild Ride is Superbly designed and built. It is not often a boat from a builder that is 400 years old becomes available in Australia. Wild Ride is a large Volume 60 FT flybridge cruiser. Being 60 ft she may be one of the smallest motor yachts that Picchiotti has built as Picchiotti is well known for building Mega Yachts and specialty built to order vessels including sailing yachts, mega yachts and motor yachts for discerning semi custom high end clientele. The engineering typical of larger craft and build philosophy from the 400 year old Italian stable shines thru in 'Wild Ride'. Innovative design is in the manufacturers DNA. 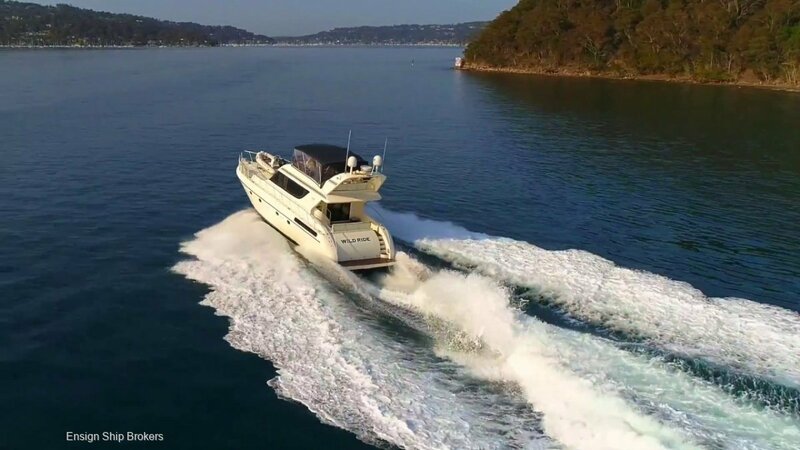 She is appointed and fitted with well known brands represented in Australia and would suit Riviera, Maritimo, Sunseeker or Princess buyers. - Bow and aft davit system for substantial tender + aft tender garage that suit accommodate a jet ski. Saloon is set aft flowing onto rear deck Opposed seating for relaxing and entertaining. Galley is split level and set below forward of saloon with opposed seating arrangement. Design is intended for ease of use and versatility for meals / drinks / and entertaining. With 3rd / day head forward of galley portside. Accommodation rear is luxurious master cabin full beam with huge storage areas and large private ensuite. Accommodation forward is a full sized double cabin with island bed also with private ensuite starboard side. Flybridge is immense and set forward with fantastic view of front deck. Electronics and amenities have been upgraded recently. Captain and mates dual pedestal seating and lounge seating along portside and rear of cockpit can accommodate 10. Offered to the market at a opportunistic price if you want quality prestige and volume 'Wild Ride' is a must consider. Call Andy from Ensign Sydney for more details.